NorthStar NSB 155FT Red front terminal, long life telecom battery delivers long life for reliable and unreliable grid conditions. 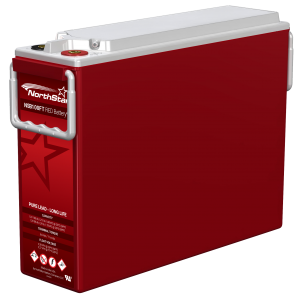 If high temperature is not an issue but you want long life in the 20⁰-35⁰C (68⁰-95⁰F) range regardless of the electric grid quality, the NSB Red battery using our pure lead, long life (TPPL) technology is an ideal choice. The battery has a recharge time of 6 hours from 50% SOC to full charge.